The Change Elements A personal (re)search on how to get excitement back into today´s (mature) organizational world By Stefan R. Pohl, inspired by the #blog2change Initiative. In the first part of the “The Change Elements” series I wrote about “The right Leadership” and how “Keeping a Beginners Mind” should be seen as a gift for organizational development and fostering motivation by excitement. In the second part I outlined “The right Organization” as being cross-linked to “Think Customer and Process“ and by that enables getting your employees minds, not just time. 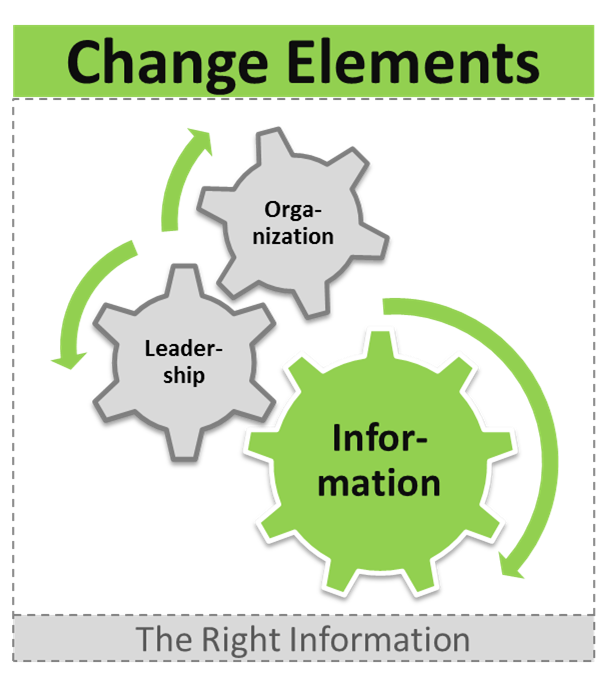 Today, I´d finally like to make a pre-christmas outlook at the third and last fundamental Change Elements: The right Information. Straight forward, this will be a short one – you have to adopt the reports and information provided out of the organization, the same way you develop your leadership culture and change your organization. Changing the information that crosses peoples´desks will mean very different things regarding each organization, but the most important thing in my opinion is that it is not forgotten at all. You could think about your customer´s CTQs (Critical To Quality Elements) and evaluate the fit of your Key Performance Indicators (KPIs). You could develop end-to-end process performance parameters to reflect your operations. Or you just could re-work your crowded reporting slides and reduce them to the main message by working on layout and content. In any case, the information´s recipients will recognize the change and will be supported – over time – in adopting their behavior. Let me close by summing up the 3 major Change Elements and related suggestions how to deal with them: First, The right Leadership and Keeping a Beginners Mind, Second, The right Organization and Think Customer and Process and third The right Information and Changing the Information that crosses peoples´ desks. Keeping this things in mind will give you a good starting point for any change effort, as big or as small it might be. Finally, thank´s for reading and following me on my „Change Elements“ journey. I hope you found some inspiration on how to bring back excitement into todays organizations and will develop your own ideas and practical implementations. Again, a big thank you to Maria Tagwerker and the Inknowaction Blog for the #blog2change Initiative and the possibility to publish my ideas. Wishing you all a Merry Chistmas and a Happy New Year!